One complaint I often hear from potential clients is that their sites are slow to load. No one wants their site to be “that site”; you know, the one that crashes your browser or takes so long for anything to show on your screen, that you just move on to something else. Bottom line: Viewers aren’t very patient and it gives a bad first impression. Slow load times can cost you sales and return visits. If that’s not enough of a reason to encourage you to read on, consider this: Google’s algorithm for site ranking includes site speed. 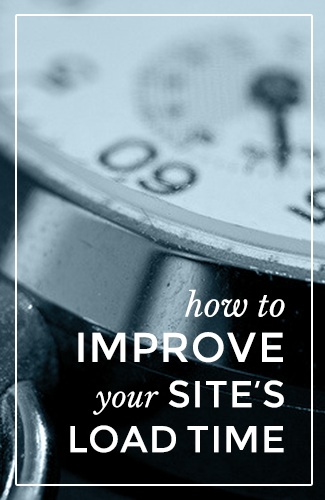 In other words, your site ranking is affected by your site’s load time. If your competitors have a quicker load time, it could mean they come up higher in search results. 1) Check your hosting: Not all hosting companies are created equal, nor are the servers that they use. If your site is loading slowly, it could be because you are not hosting your site with a quality host. 2) Know your theme: Choosing a theme has an impact on more than just the look of your site. A bad theme may be so weighed down by messy (sometimes malicious) code that your site will get hung up on loading no matter what other measures you take. It’s not worth the risk, just to save some extra bucks. Invest in a theme from a reputable company, or make sure that your web developer is doing the same. 3) Compress images for the web: Image size is a common oversight. You might be aware that image size affects load time, but did you know that just cropping an image or making it smaller does not have an affect on the file size of the image? In order for it to make a difference, make sure that your images are saved for web quality: usually 72 dpi resolution. This includes all images and graphics, from your header, to your background, to the photos in your post. There is no reason to have print quality images on your site, especially at the expense of your viewers. 4) Get rid of what you don’t need: Is everything on your sidebar necessary? Are all of those plugins really improving your site’s usability? Also: just because a plugin is “deactivated” doesn’t mean it’s not having an impact. Delete any plugins which are inactive or that your are not using. 5) Consider your Content Management System (CMS): Just like hosting and themes: not all CMS’s are created equal. Most of the popular ones are popular for a reason. But if you aren’t running the most current version of your CMS, it’s not only a security risk… It could be slowing down your site. 6) Look into Google Webmaster tools: Create your free account, sign your sites up and find out how Google sees your sites, receive alerts, analyze data and much more. There are many things that might be causing your site to load slowly, but this list is a great place to start troubleshooting. It might take a bit of time to carefully look each of these possible issues over, but your potential clients will thank you, in sales or return visits. If you still need help troubleshooting or need to get set up on a fast-loading, SEO-friendly theme, please contact us.